The Family Obstacle Run was chosen last year as “Best Family Run from Netherlands. Are you as a family in search of the Ultimate Family Challenge? Whether you want to engage in sports and unique challenge with your friends / girlfriends? Then write together for the Strong Viking Family Run – The Obstacle Run for Friends & Family! 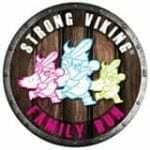 The Strong Viking Family Run (formerly Color Obstacle Run) is an Obstacle Run of 3km or 5km run which is combined with overcoming obstacles. It is the perfect challenge for you as outdoor sports’ enthusiast! The Strong Viking Family Run is completely dominated by Obstacles, Fun, Mud & natural Colors!